There’s a Prelude to Porgy: the pre-A.R.T. Press Opening Publicity. Besides the disaster-plagued “Spiderman: Turn off the Dark,” has any bound-for-Broadway musical ever received the pre-opening avalanche of negative opinion as the American Repertory Theater’s new-and-promised-to-have-been-improved “The Gershwins’® Porgy and Bess®?” The vituperative letter in The New York Times by Stephen Sondheim (which attracted as much attention as his past several shows) eviscerating the new production’s dumbing down of “P&B” spawned hundreds of similarly negative responses. The internet, radio, and mainstream press have been abuzz with advance tales of horror about what four powerful women have done to tinker with, if not wreck what is widely seen as America’s Greatest Opera,which began its life on stage here at the Colonial Theater in Boston in 1935. There was, then, an almost immediate reworking of the score to make it shorter than its original four hours, leading Diane Paulus and Company to take it upon themselves seventy-five years later to tinker yet some more, saying that is what Gershwin would have done had he lived longer. (The current production clocks in at two and half hours, with intermission). Chutzpah might be the operative word for this tale of production — so far — in every sense. Suzan-Lori Parks was hired to “re-envision” it. “I’m gonna add some dialogue,” she warned us. One example of her visionary powers featured Porgy’s “I’ve Got Plenty o’ Nuttin’,” which she understands now to be Porgy’s post-coital boast. “It’s not a happy darky song anymore… It accomplishes a political purpose.” Huh? Inside the program book is more from this McArthur Genius Award recipient: “I allowed myself to see Porgy and Bess as a piece of writing that, while not morally flawed, very much needed to be fleshed out… to give it new life… “Porgy and Bess” was written by white authors [(!)] attempting to replicate an ‘authentic’ black voice… I feel the writing sometimes suffers from what I call “a shortcoming of understanding. '” This is too delicious to leave unnoticed in the program book. “We didn’t want just another production of it, you know,” Robert Kimball, a musical theater historian who doubles as adviser to the Ira and Leonore Gershwin Trust. “We can get plenty of those.” Just another Plenty of Nothings? Was this promised overhaul by the Gang of Four (AR.T. Artistic Director Diane Paulus, playwright Suzan-Lori Parks, composer Diedre L. Murray, and superstar Audra McDonald) the Gershwin Estate’s answer to what they perceived as long-awaited success on Broadway? For much more about this matter, please read the brilliant piece in BMInt by Howard Pollack, whose George Gershwin: His Work and Life (2006) is indispensable and a great read, and Steven Ledbetter, whose review here of the BSO’s “Porgy” was a model of thorough, inspired reviewing. I also thoroughly recommend Edward Jablonski’s Gershwin: A Biography‘ (1987). 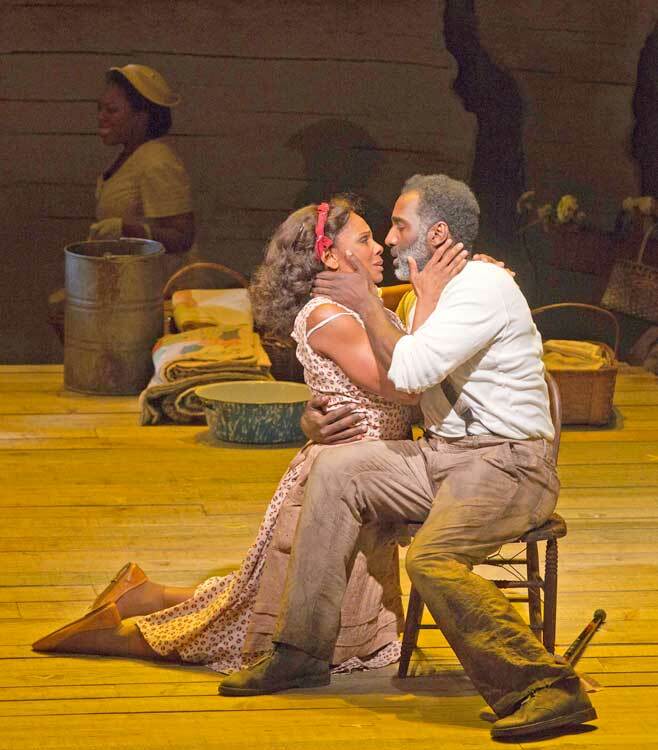 The pre-opening press surely raised some theatergoers’ hopes — or fears — about what was being referred to as the “re-imagining” of Porgy and Bess. As superstar Audra McDonald (opening the Celebrity Series in October) said in an interview with The Boston Globe, “We’ve had to change some things around so it can be palatable to a 21st-century audience.” What is a 21st-century audience, anyway? One that is used to Broadway shows being overly miked? Check; this production does that. One with no inkling of the glory of “Porgy and Bess” with a full or even half an orchestra? Sure, there are a lot of first-timers lured in by the publicity or just the chance to catch a great musical, whatever that is, these days. One who doesn’t even know who George Gershwin is except as the composer of jazz standards? One who likes upbeat, uplifting endings? Yup. And judging by overheard conversations last night, those people were very happy indeed. A great evening out. Well, it might have been unless you’ve seen or heard it before. 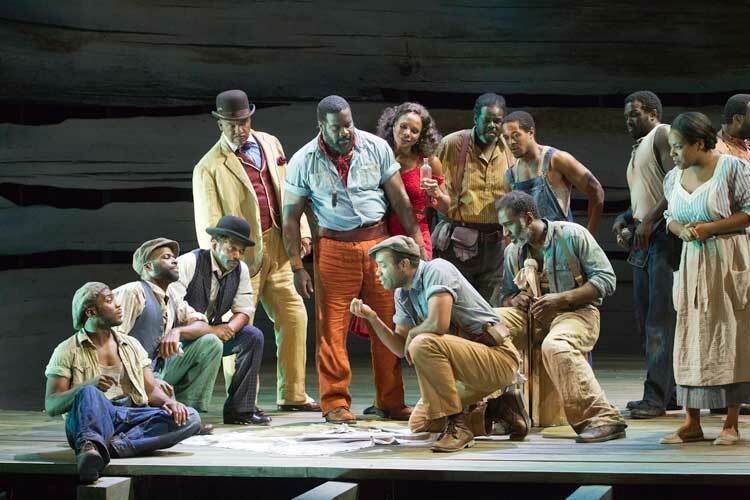 Adding to this writer’s woes was last week’s exquisite performance of the original 1935 Porgy and Bess at Tanglewood (featuring the Boston Symphony conducted brilliantly by Bramwell Tovey, with the sublime 120-person Tanglewood Festival Chorus and a very good cast). The universally negative vibes around this tinkered-with American Repertory Theater production from both music and theater critics led this writer to the performance with a great deal of trepidation. Now for the “Summertime” Showdown. The first thing one noticed — after the nondescript amorphous half-oval set with streaks of horizontal slits in it, sort of like the inside of a tree trunk (Scenic Design by Riccardo Hernandez) — was Clara (Nikki Renée Daniels) singing Gershwin’s biggest hit ever to her baby. I must have heard “Summertime” by every soprano with a still-working voice, and so I was befuddled; this was the best voice they could get? I was shocked. Later, she sang it better, and then The Voice, Audra McDonald sang it to Clara’s baby, and we knew exactly how a real artist sings it. It was an inauspicious opening. The casting was generally strong. McDonald fans (of which I am one) will not be disappointed in her Bess. That the Bess in many early productions is around twenty years old — McDonald is in her early forties and looks here like she’s seen more than her share of troubles — didn’t bother me. This Bess can out-sing and out-act nearly everyone in this production, and she certainly has the body (she’s onstage in a slip or clingy dresses much of the time) of a twenty-year old. The problem is that her Bess was supposed to be more a three-dimensional Bess, with a back story I didn’t catch. Or was there none, or was it deleted after all the press ado? This was supposed to be a, yes, “21st century” Bess, not just a pawn of her men (Porgy, Sportin’ Life, Crown), a Bess with moxie. Well, maybe. But at least she sang a great “Summertime,” and for that matter, performed everything beautifully. The seventeen-piece band and twenty-or-so voices that made up the choir seemed thin, if not anemic, throughout. Sportin’ Life (David Alan Grier) who has two of the show’s best numbers, “It Ain’t Necessarily So” and “There’s a Boat that’s Leaving Soon for New York,” belts it out, but his characterization isn’t snarky and snaky enough. He’s missing the evil soul that Sportin’ Life, the ruiner of others’ lives, needs to portray. It doesn’t help that he followed the Sportin Life of Jermaine Smith in the BSO production last week at Tanglewood; he gave the most memorable performance of both casts, combined. Philip Boykin’s Crown was GOOD. At least twice the size of Bess, with enormous chiseled upper arms (that I will remember long after I forget this production), Crown was literally a terrifying presence whenever he was on stage. He was perfectly cast and did a great job. Norm Lewis’s Porgy was a revelation. His one newly-added sentence, that he was born crippled, was gratuitous; is this his promised “improved back story”? His Porgy is humane and proud and wildly besotted by Bess, the first woman to have paid him attention as a man. His scenes with Bess were thoroughly moving, and I almost found myself cheering for the happy ending we had been promised in the show’s early publicity. What I did miss was Porgy’s famous line about getting his goat cart, which played no part in this production. Instead this Porgy is outfitted with a leg brace and a cane, as he shuffles off toward New York, singing “I’m on My Way” with his well-wishing back-up singers having left the stage. Yeah, Broadway audiences will love this. Here’s a radical idea: have Eric Jackson play the BSO Tanglewood performance on WGBH-FM 89.7 so everyone in Greater Boston can hear it. And announce it early enough so people can make time for the broadcast. A couple of points to mention. The reason Nikki Daniels was not projecting so well probably had more to do with Diedre Murray’s decision to transpose “Summertime” down by a significant factor (my guess is about a third) than any lack of ability on the singer’s part; she has done this role before with the New York City Opera. Murray justified the transposition in her statements to the press by saying that Summertime is a lullaby, and who would sing a lullaby in a high soprano? I had to slap my forehead when I read that one–of course! and why wouldn’t a composer want to write a number that puts its listeners to sleep? The orchestra for the performance I saw had a cello and a bass, rather than two basses, and the accordion was a standard one rather than a concertina. Still, the larger point is valid: the orchestration was underpowered for this score, and it also masked some of the most powerful music. 1. I had been unaware, until reading the Wikipedia article on P&B, that in addition to directing the full-bore operatic performance at Glyndebourne in 1986, Trevor Nunn had prepared his own edition in the form of a musical, as recently as 2006. Add that to the 1942 Cheryl Crawford version, the 1952 Davis-Breen version, and the much-despised (at least by the Gershwin estate, which 50 years ago still considered artistic quality and respect for the original as values to promote) 1959 movie, and one is left wondering why the ART considered a new adaptation necessary. At least an explanation was in order–to read ART’s materials you would think theirs was the first adaptation in 50 years. 2. Small detail: why was the time the action takes place moved from the early 1920s (per the book, play and opera) to the late 1930s, as stated in the program? Was there some significance I missed? Nothing about the production suggested this was the middle of the Depression–the men mostly seemed to have jobs, everyone had at least enough money to buy their food, albeit not enough to pay for a proper burial for Robbins. Was this by design, accident, or ignorance? 4. Since I do know the source material, and a good deal of the audience will know it as well, my reaction would be one of disappointment: if you’re going to take America’s greatest opera and turn it into a musical, you should be trying to produce America’s greatest musical. The creators should have been shooting for “Show Boat,” but what came out was more like “Annie”–a vehicle for mediocre performers to belt out unrefined music in foghorn-quality chest tones rather than the exquisite soaring lines of the originals. Moreover, the musical alterations–the transpositions to accomplish the foregoing, the disco beat applied to the picnic music, the softening of the dissonances in the overture, the masking of Gershwin’s complex accompaniments–diminish the musical impact without providing any compensating advantages. The didactic use of language to provide back-story and a suggestion that Porgy’s ultimate quest to retrieve Bess from New York might succeed, betrays distrust of acting by superior performers to convey nuance, and an almost zombie-like retreat from emotional complexity. 5. There were many worthy contributions from the toilers in the field for this production: the actors, musicians, lighting and stage designers (I actually thought the set was pretty good, and it opened up nicely for the hurricane scene). What was wrong was the rot (in many senses) at the top. This production was fundamentally misconceived, in aid of an unworthy objective. Did they cut Bess’s famous love aria “Porgy, amor”? 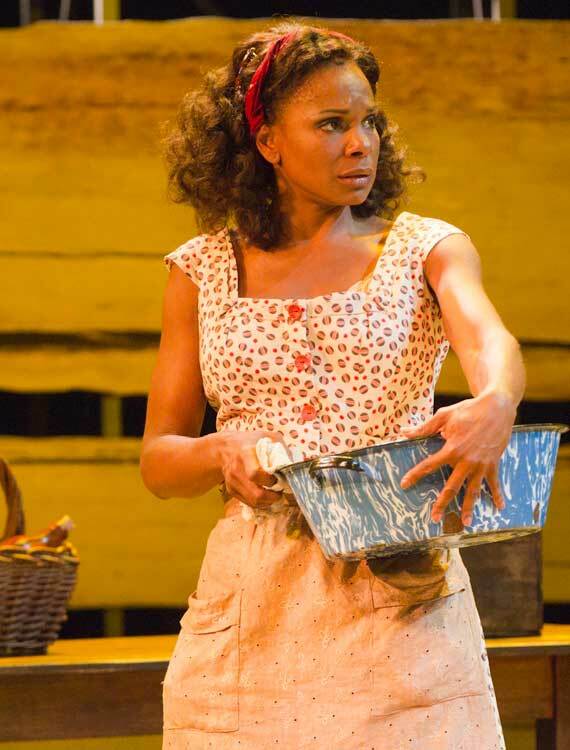 I love every word of Vance Koven’s superb piece, especially the “rot (in many senses) at the top.” I, however, would give the production a C. I can’t recommend it to anyone who has heard or seen it before, especially during the week Audra McDonald takes off. I think there is, in Vance’s words, a zombie-like retreat from complexity, period.